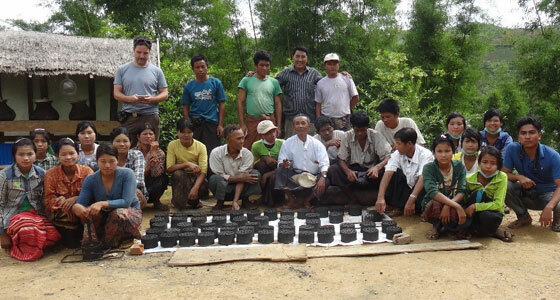 To address rural energy problems, twenty seven villagers from Kyang Taung, Kyang Nur, Pantin, Thyetpin, Antpet and Zeyar, Myanmar were trained to make bio-briquettes using unwanted biomass such as forest weeds, pine needles and bamboo branches. The training was held at the Kyang Taung village library 16-18 June and included 14 men and 13 women. 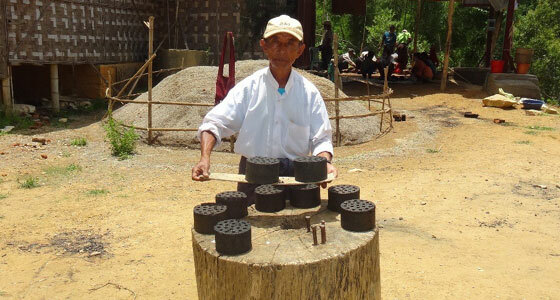 After a demonstration, participants were provided an opportunity to make several of their own briquettes. Dry biomass of Banmara (Eupatorium adhenophorum) collected by local people and MIID staff in the village was used for the charcoal preparation. Charcoal was collected from a pit and ground into fine powder using locally available materials such as stone, bricks and wood. The powder was then mixed with bentonite clay soil at the ratio of 3:1 to form a paste. The paste was then moulded in an iron press. The training was conducted with support of HIMALICA project in collaboration with the Myanmar Institute of Integrated Development (MIID).